But see below for the full details of the Cyclone FX's enhancements. 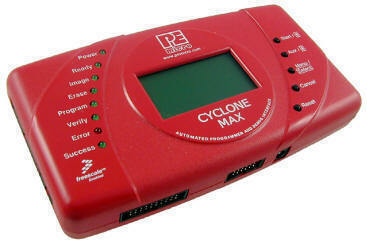 Cyclone Max supports --- ARM®, ColdFire, MPC5xx/8xx, Qorivva 55xx/56xx/57xx (AKA Nexus), MAC7xxx, PX and DSC Series MCUs. Interactive programming packages are provided for each Models supported CPU families. 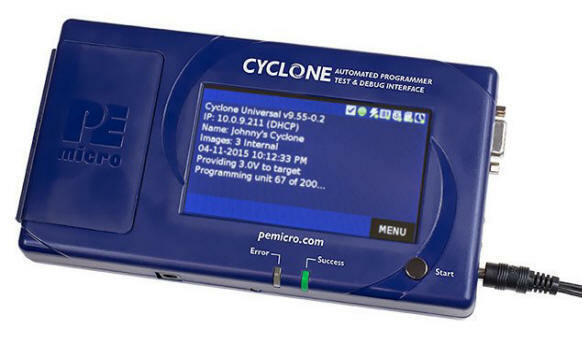 Or you can link the unit to a PC, download multiple target programs to it and then disconnecting it from the PC The Cyclone then becomes a manually controlled, standalone flash programmer for on chip or off chip memory. Or they can be driven by a PC via the Ethernet, USB or Serial port with automated commands either using command line instructions or from a C program using the dll included in the package. For the Universal, ARM, Max and Pro if using GCC/GDB, Keil, IAR, CodeWarrior or with the addition of PEmicro Windows based Debugger ( which works with Assembler and C ) allows them to be used to debug code by downloading it to memory and having the ability to set breakpoints, run the CPU at full speed, slowly or in single step mode, access to memory and the registers, . Support for the Cyclone is being provided by a number of leading C compiler manufacturers within their C Debugging environment. Max provide 2Gbytes of additional memory images implemented using a compact Flash card (one included). This allows for faster, easier, and more flexible programming of data whether it is during field updates or on production runs. The Universal and ARM units have an SDHC memory port and this will shortly be supported, for added storage capacity and flexibility.